324 pages | 26 B/W Illus. Since the 2008 financial crash the expansion of neoliberalism has had an enormous impact on nature-society relations around the world. In response, various environmental movements have emerged opposing the neoliberal restructuring of environmental policies using arguments that often bridge traditional divisions between the environmental and labour agendas. The Right to Nature explores the differing experiences of a number of environmental-social movements and struggles from the point of view of both activists and academics. 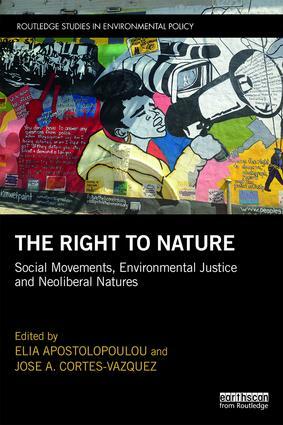 This collection attempts to both document the social-ecological impacts of neoliberal attempts to exploit non-human nature in the post-crisis context and to analyse the opposition of emerging environmental movements and their demands for a radically different production of nature based on social needs and environmental justice. It also provides a necessary space for the exchange of ideas and experiences between academics and activists and aims to motivate further academic-activist collaborations around alternative and counter-hegemonic re-thinking of environmental politics. This book will be of great interest to students, scholars and activists interested in environmental policy, environmental justice, social and environmental movements. Self-determination as resistance: re-asserting control over natural resources in Colombia. Petro-Politics and Local Natural Resource Protection: Grassroots Opposition to the Keystone XL Pipeline in Nebraska. Navigating state-led extractivism in Ecuador and Russia: fluid identities and agendas of socio-environmental movements. Beyond winning and losing: the rise of the social movement against mega-mining projects in Northern Greece. Land rights and justice in neoliberal Mozambique: The case of Afungi community relocations. Possibilities and Pitfalls of Environmental Justice Action: Learning from Roşia Montană and Yaigojé Apaporis Anti-mining Struggles. Egyptian Environmentalism and Urban Grassroots Mobilisation. Landscape and outdoor domestic space towards food sovereignty and environmental regeneration: approaches from Mozambique and Latin America. Access to information and the construction of sustainability discourse in the case of the Bus Rapid Transit Transolímpica, in Rio de Janeiro. The Political Ecology of Urban Space in Transition. Environmental justice claims and dimensions in anti-megaproject campaigns in Europe: The case of the forum against Unnecessary and Imposed Megaprojects. Isolation and abstraction to tackle deforestation: The problem of theory as a practical problem in environmental issues. Natural capital accounting (NCA): roles in corporate environmental stewardship. Nature is our Right: Framing a new nature protection debate in Europe. The commons as organizing infrastructure: Indigenous collaborations and post-neoliberal visions in Ecuador. Illegal Camping on ‘Stolen Native Land’. Gerontocracies of affect: how the "politics of austerity" have reshaped elder environmental radicalism. Humans in the landscape: Low-impact Development as a response to the neoliberal environmental agenda. Elia Apostolopoulou is a Lecturer at the University of Cambridge, UK. Jose A. Cortes-Vazquez is an InTalent senior researcher at the University of A Coruña, Spain.